In this novel Cronin tells again the story of a doctor. It is a tale of love, research, religious views, personal tragedies and betrayel. 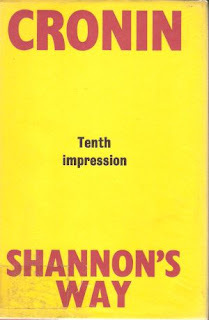 The writer narrating in first person makes us acquainted with Robert Shannon a young Catholic doctor in the after-war England. He works as an university research physician but in the meantime he does his own study on an epidemy in the laboratory of his own workplace. Soon he has to leave his job because he is in conflict with the leading professor who can't stand him and wants Shannon to focus on the lab's priority. Due to this he has to endure hardships and struggles to find a job. He fells in love with Jean Law, but her parents are against this relationship because he is a Roman Catholic and do not share his view on religion. Shannon sais: "Religion is a private affair. We can't help what creed we're born into. It's quite possibile for two people to be tolerant of each other's belief." But her father denies it saying that "She can never commingle with the waters of Babylon". Cronin's novels shows us a world where personal, family or group interests are the most important. The death of the patient is overlooked. The nurse who caused the death by a stupid mistake keeps his job while Shannon is layed off by a commission just because he did experiments in an unused room thus misusing the taxpayers' money. But there are good people like the marginalized professor Challis who supports him even getting him a doctor job having at his disposal a good lab for his research. Some novels of A. J. Cronin do not have a happy ending, I only disclose for the reader that this book has an open ending with hope in the future. I enjoyed and liked this novel and give it five stars. Found out the ending reading this book! Check Shannon's Way at Amazon.